Jennifer McGuire often white embosses and colors images on a kraft background. I love the look and that is what I did here. This is Stampin' Up! 's version of kraft now called Crumb Cake. The image is from American Crafts Soho Garden set and the sentiment from an old Stampin' Up! set. I did the coloring with Prismacolor pencils. lisa this is sooooo cute!!! i just rearranged my ink refill/embossing powder drawer and i think i have to emboss on kraft now too!!! 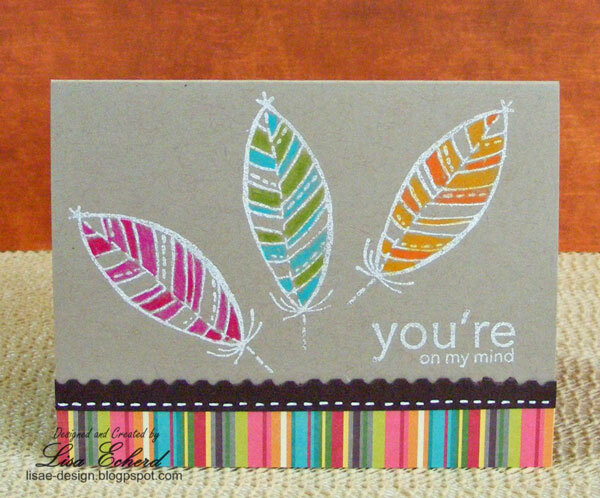 This is a lovely card! I like the coloring on the feathers. I can't stop looking at this card, Lisa. It's fabulous and the colors are so fresh and pretty against the kraft.